The angular diameter, angular size, apparent diameter, or apparent size is an angular measurement describing how large a sphere or circle appears from a given point of view. In the vision sciences, it is called the visual angle, and in optics, it is the angular aperture (of a lens). The angular diameter can alternatively be thought of as the angle through which an eye or camera must rotate to look from one side of an apparent circle to the opposite side. Angular radius equals half the angular diameter. , and the result obtained is in radians. Approximate angles of 10°, 20°, 5°, and 1° for the hand outstretched arm's length. Estimates of angular diameter may be obtained by holding the hand at right angles to a fully extended arm, as shown in the figure. = (206,265) d / D arcseconds. 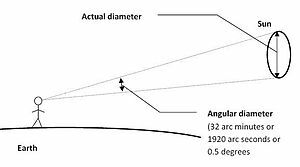 Thus, the angular diameter of Earth's orbit around the Sun as viewed from a distance of 1 pc is 2″, as 1 AU is the mean radius of Earth's orbit. The angular diameter of the Sun, from a distance of one light-year, is 0.03″, and that of Earth 0.0003″. The angular diameter 0.03″ of the Sun given above is approximately the same as that of a person at a distance of the diameter of Earth. Andromeda Galaxy 3°10′ by 1° About six times the size of the Sun or the Moon. Only the much smaller core is visible without long-exposure photography. Comparison of angular diameter of the Sun, Moon and planets. To get a true representation of the sizes, view the image at a distance of 103 times the width of the "Moon: max." circle. For example, if this circle is 5 cm wide on your monitor, view it from 5.15 m away. 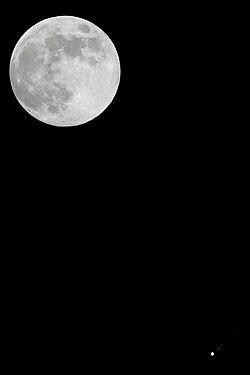 This photo compares the apparent sizes of Jupiter and its four Galilean moons (Callisto at maximum elongation) with the apparent diameter of the full Moon during their conjunction on 10 April 2017. 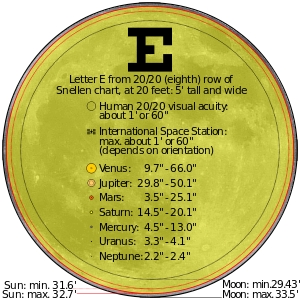 The table shows that the angular diameter of Sun, when seen from Earth is approximately 32′ (1920″ or 0.53°), as illustrated above. The angular diameter of the Sun is also about 250,000 times that of Alpha Centauri A (it has about the same diameter and the distance is 250,000 times as much; the Sun is 4×1010 times as bright, corresponding to an angular diameter ratio of 200,000, so Alpha Centauri A is a little brighter per unit solid angle). Even though Pluto is physically larger than Ceres, when viewed from Earth (e.g., through the Hubble Space Telescope) Ceres has a much larger apparent size. Angular sizes measured in degrees are useful for larger patches of sky. (For example, the three stars of the Belt cover about 4.5° of angular size.) However, much finer units are needed to measure the angular sizes of galaxies, nebulae, or other objects of the night sky. To put this in perspective, the full Moon as viewed from Earth is about ​1⁄2°, or 30′ (or 1800″). The Moon's motion across the sky can be measured in angular size: approximately 15° every hour, or 15″ per second. A one-mile-long line painted on the face of the Moon would appear from Earth to be about 1″ in length. In non-Euclidean space, such as our expanding universe, the angular diameter distance is only one of several definitions of distance, so that there can be different "distances" to the same object. See Distance measures (cosmology). Many deep-sky objects such as galaxies and nebulae appear non-circular and are thus typically given two measures of diameter: major axis and minor axis. For example, the Small Magellanic Cloud has a visual apparent diameter of 5° 20′ × 3° 5′. Defect of illumination is the maximum angular width of the unilluminated part of a celestial body seen by a given observer. For example, if an object is 40″ of arc across and is 75% illuminated, the defect of illumination is 10″. ^ This can be derived using the formula for the length of a cord found at "Circular Segment". Archived from the original on 2014-12-21. Retrieved 2015-01-23. ^ "A Taylor series for the functionarctan" (PDF). Archived (PDF) from the original on 2015-02-18. Retrieved 2015-01-23. ^ "Coordinate Systems". Archived from the original on 2015-01-21. Retrieved 2015-01-21. ^ "Photographing Satellites". 8 June 2013. Archived from the original on 21 January 2015. ^ Michael A. Seeds; Dana E. Backman (2010). Stars and Galaxies (7 ed.). Brooks Cole. p. 39. ISBN 978-0-538-73317-5. ^ 800 000 times smaller angular diameter than that of Alnitak as seen from Earth. Alnitak is a blue star so it gives off a lot of light for its size. If it were 800 000 times further away then it would be magnitude 31.5, at the limit of what Hubble can see.